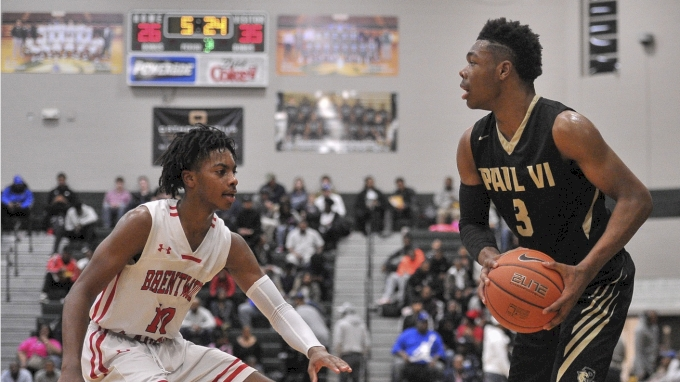 Anthony Harris Jr. is stepping up in all of the big moments as the WCAC playoffs draw closer for his 10th-ranked Paul VI (VA) team. In a month in which the Panthers could have fallen to adversity after seeing a season-ending injury to senior starter Brandon Slater and a small sprained ankle that kept point guard Jeremy Roach sidelined, it was Harris who came ready to answer the call. Since the first injury hit Paul VI in early February, the 6-foot-3 sophomore guard has turned on clutch mode, averaging 18.3 points per game in his squad's last four games. This past Friday, Harris dropped the game-winning bucket in the Panthers' victory over conference rival and No. 17 DeMatha (MD), which sits second in the WCAC standings at 14-4 behind Paul VI (18-0). Though Roach, a sensational sophomore, is set to return, it would be foolish to sleep on the rest of the Panthers backcourt, including Harris. Watch the WCAC semifinals and finals LIVE on FloHoops on Sunday, Feb. 25, and Monday, Feb. 26.